*With 2 Year Price Guarantee with AT120 starting at $59.99 compared to everyday price. What Channel is FOX on DISH? FOX is a local channel and the channel number will vary based on location. The best series meet on FOX. FOX’s lineup features great series such as Empire, Star, Last Man Standing, Family Guy, and Bob’s Burgers. From Masterchef to the Teen Choice Awards, FOX has programs that appeal to anyone. Being a chef takes guts. Gordon Ramsey is here to make sure you pass the test. In Hell’s Kitchen, aspiring chefs compete to be the last one standing amongst their group. At the end of the season, one lucky chef walks away with the ultimate prize: their own restaurant. With over 30 seasons on the air, this long-running animated series needs no introduction. Residing in the town of Springfield, the Simpsons aren’t your ordinary family. But Springfield also isn’t your ordinary town, filled with equally eccentric residents and events. Follow their adventures in this animated comedy. Do you have what it takes to be a professional dancer? Prove it on So You Think You Can Dance. Aspiring dancers work to make their dreams come true on this dance-themed competition series. You only get one shot to prove you’re the best dancer. Use it well on So You Think You Can Dance. *All offers require credit qualification, 2-Year commitment with early termination fee and eAutoPay. After 3 mos., you will be billed $30/mo. for Showtime, STARZ, and DISH Movie Pack unless you call or go online to cancel. 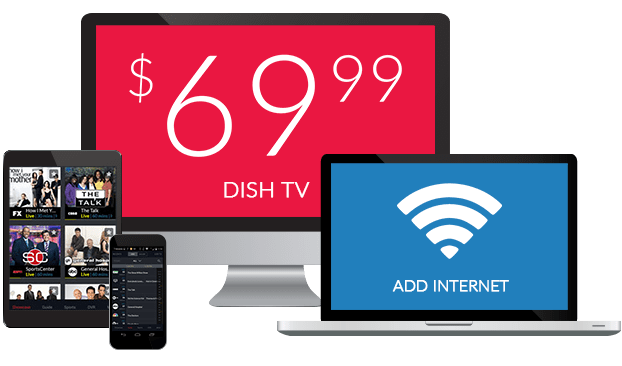 Save hundreds by switching to DISH! Get Exclusive DISH Deals In Your Inbox Today! Altitude Marketing, L.L.C. is an authorized independent contractor retailer of DISH Network L.L.C. DISH, DISH Network and DISH Network logos are registered trademarks and/or service marks of DISH Network L.L.C. and/or its affiliate(s). The DISH Network trademarks and/or service marks are used by authority of DISH Network L.L.C. and/or its applicable affiliate(s). *All offers require credit qualification, 2-Year commitment with early termination fee and eAutoPay - Free Hopper upgrade available with qualifying packages - After 3 mos., you will be billed $20/mo. for Showtime and DISH Movie Pack unless you call to cancel. **Google and Google Home Mini are trademarks of Google LLC. Offer for new and qualifying former customers only. Important terms and conditions: All offers require credit qualification, 2-year commitment with early termination fee, and eAutoPay. Upfront activation and/or receiver upgrade fees may apply based on credit qualification. Offer ends 10/07/19. 2-year commitment: Early termination fee of $20/mo. remaining applies if you cancel early. Included in 2-year price guaranteed at $39.99 advertised price: Programming package DishLATINO Plus, DVR Hoper Duo for 1 TV, a Joey receiver to connect the 2nd TV, and HD service. Local channels not included. After 2 years, then-current DVR and receiver monthly fees apply. Available with 2-year price guarantee for additional cost: Different package options with a DVR Hopper Duo for the 1 TV ($29.99 for DishLATINO Clásico or $52.99 for DishLATINO Dos, $67.99 for DishLATINO Max) Local channels ($12), monthly fees for upgraded or additional receivers ($5 per additional TV, receivers with additional functionality may be $5-$15) and monthly charges for DVR service ($10-15). NOT included in 2-year price guarantee or advertised price (and subject to change): Taxes & surcharges, add-on programming (including premium channels), DISH Protect, and transactional fees. Premium Channels: Free for 3 months: After 3 months, you will be billed $20/mo. for Showtime and DISH Movie Pack unless you call us to cancel before the 3 months period. Other: All packages, programming, features, and functionality and all prices and fees not included in price guaranteed are subject to change without notice. After 6 mos., if selected you will be billed $9.99/mo. for DISH Protect Silver unless you call to cancel. After 2 years, then-current everyday prices for all services apply. For business customers, additional monthly fees may apply. Free standard professional installation only. © 2019 DISH Network L.L.C. All rights reserved. Copyright © 2019 Planet DISH. All Rights Reserved.